Gene regulation is generally thought to be a linear process where transcriptional and translational regulation play independent roles in modulating gene expression. In the canonical model, mRNAs transcribed from a given gene always carry the same set of information and are later modified by other, independent mechanisms such as splicing or RNA editing. However, widespread alternative promoter usage, as shown by high-throughput transcription start site (TSS) mapping, suggests that mRNAs (from the same gene) generated by different TSSs can carry different information in their 5’ leaders, which in turn instructs translation. For example, expression can be altered by simply having one isoform contain an upstream open reading frame (uORF) that prevents proper translation of the correct ORF. The authors have first dissected this mechanism in the context of a single, essential gene and later have shown it to be pervasive in yeast meiosis. However, whether or not mammalian cells use such an integrated mechanism remains unknown. This preprint highlights a specific oncogene in humans, MDM2, where such a mechanism occurs and show that it might play an important role in regulating stem cell differentiation. The primary claim of the preprint is that MDM2 is regulated by an integrated transcriptional and translational mechanism. By toggling between two separate promoters, two mRNA transcripts with different translational efficiencies are produced (Figure 1). To test this hypothesis, the authors defined 3 key features of integrated regulation from their previous observations in yeast and proceeded to test whether these mechanisms also apply to MDM2 regulation. Figure 1. Summary of MDM2 regulation by an integrated mechanism (Figure 5 of the preprint). One, the isoform from the distal promoter contains an uORF that represses proper translation. MDM2 has previously been shown to express two different isoforms, a longer isoform called MDM2LUTI and a shorter isoform, MDM2PROX, from the distal (P1) and proximal (P2) promoters respectively. MDM2LUTI contains 2 additional uORFs in its 5’ leader, and is therefore translated less efficiently than MDM2PROX, which only carries the main ORF (and no uORF). Two, transcription from the distal promoter disrupts transcription from the proximal promoter, allowing for a complete switch of promoter usage. This step is extremely crucial to ensure that only the desired transcript is produced. To test this, the authors used a CRISPR/dCas9-based transcription inhibition technique using a catalytically dead Cas9 (CRISPRi) to inhibit expression at the P1 promoter, and showed that expression of MDM2PROX was indeed increased. The same trend was observed despite inhibition of p53 expression, a known activator of the P2 promoter, suggesting that the upregulation of MDM2PROX was independent of p53 activation. These results imply that P1 most likely inhibits P2 expression directly through transcriptional inhibition rather than some secondary pathway. To understand how this inhibition is achieved, the authors then measured the levels of H3K36me3 in the promoters and gene body of MDM2. H3K36me3 is a co-transcriptional modification, and is thus a mark of active transcription. It has also been implicated in repression of spurious transcription. Indeed, when P1 is inhibited, there is a decrease in H3K36me3 signal at the P1 and P2 promoters. This suggests that when P1 is transcribed, H3K36me3 is deposited at P2, which then represses it activity. Finally, usage of the two promoters should be actively regulated by a developmental switch of some sort. In this preprint, the authors assessed this using an in vitro differentiation model, where they induced human embryonic stem cell (hESC) differentiation into neuronal and endodermal lineages and measured promoter usage throughout the differentiation process. They found that neuronal precursor cells and endodermal cells appear to prefer MDM2PROX, despite higher expression of MDM2LUTI than MDM2PROX in hESCs. 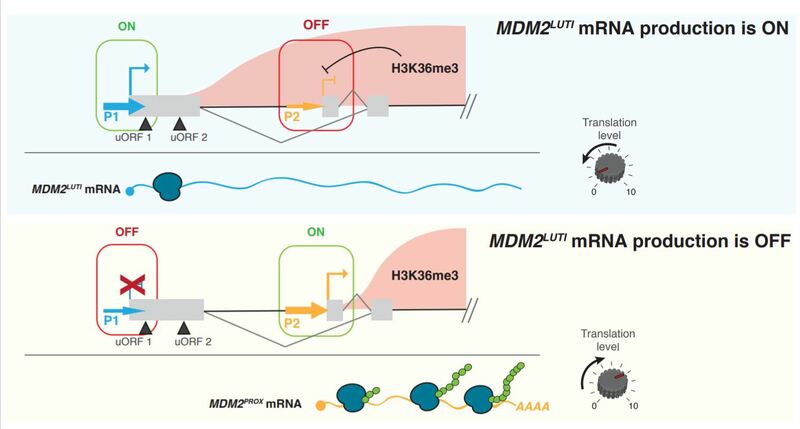 This suggests that promoter usage for MDM2 is developmentally regulated, and the integrated regulation could represent a mechanism by which proper gene expression is achieved during development. Gene regulation is generally thought of as a complex series of steps. However, the idea that transcriptional and translational regulation can be integrated actually simplifies the model. If the different steps are independent, we would have had to evolve mechanisms of controlling each step for optimal expression. Using this mechanism, the regulation is at the level of the promoter toggle, and translational regulation is simply a consequence of transcription. Personally, I find this idea quite comforting, because it means there are less steps to conquer in our understanding of gene expression. This mechanism also highlights how non-coding DNA can be used to regulate translation instead of transcription, which is something that we can use to understand the role of non-coding variants in development and disease. Finally, I think that the authors did a really good job laying out the hypothesis and its predictions and then systematically testing each prediction, something that is too often lacking in many scientific papers. The obvious next step from this finding is to figure out how ubiquitous this regulation mechanism is in human cells, especially for developmentally important genes. I would also be very interested to understand exactly what signals determine which promoter is used, since it seems like the MDM2LUTI is preferred in neuronal precursors and endodermal cells, but not in differentiated neurons. Specifically, since the expression of MDM2 was only measured up to day 4 of endodermal differentiation, if they were allowed to grow further, would those cells also switch back to MDM2LUTI or continue to prefer MDM2PROX ? Furthermore, H3K36me3 is postulated to be the mechanism by which the P1 transcript represses transcription from P2. It would be important to see what happens when the H3K36me3 writer enzyme in the cell types used is downregulated. Is P1 and P2 transcription now able to occur simultaneously, or does active transcription from P1 simply limit RNA polymerase access to P2 and thereby physically block transcription? Understanding how promoter usage is regulated could lead to many insights into basic transcriptional mechanisms and disease, such as the switch of the MDM2 promoter observed in cancer. Alexandra Despang, Robert Schöpflin, Martin Franke, et al. Akira Wiberg, Gwenaelle Douaud, Michael Ng, et al. 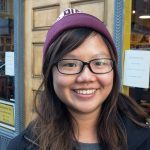 Emily Yun-Chia Chang, James P Wells, Shu-Huei Tsai, et al.